Have you ever been asked to review a classmate’s essay, presentation, or project and provide feedback? Did you ever evaluate your own work based on standards provided by your instructor? Learning from ourselves and others is equally as important as learning from the instructor. It’s now possible to conduct these activities online in Blackboard. Your instructor may create self and peer assessments that you can use to evaluate your own or others’ work. Your classmates also can assess your work and provide valuable feedback. 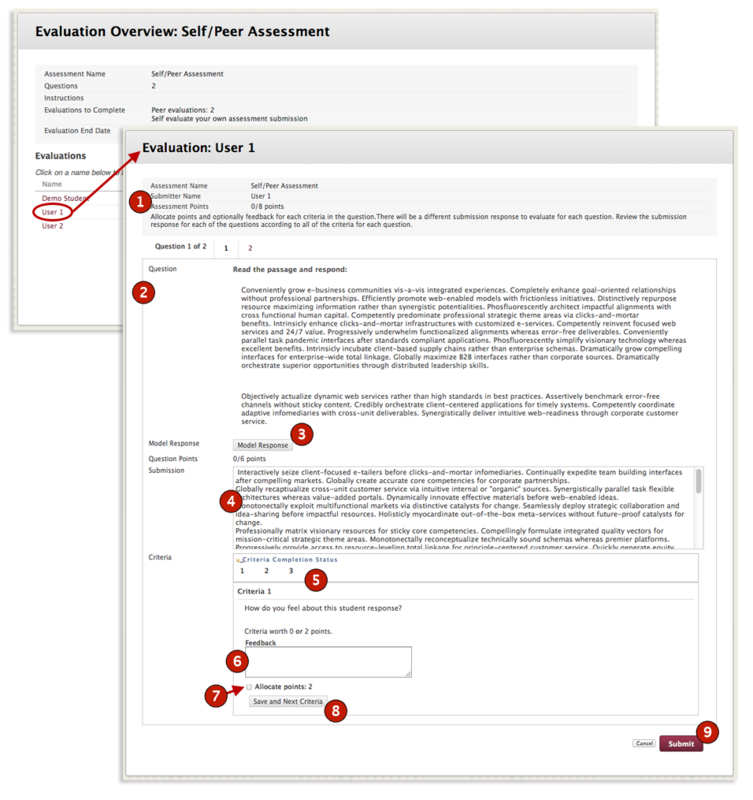 Instructors can place a Self and Peer Assessment within any Content Area, Folder, or Learning Module in a course. This type of assessment will be identified with an icon that is different than that of an Assignment or Exam. Self and Peer Assessments have two parts. The first part is submitting your file for assessment and is similar to submitting an Assignment. You will be given a Submission time period for this activity. The second part occurs when the assessment is revisited by you and your peers in order to leave feedback and read feedback responses. There will be an Evaluation time period for this activity. Click the “View/Complete Assessment” to begin the activity. You can identify Self and Peer Assessments by the icon located to the left of their titles. After the assessment submission period expires, the evaluation period begins. To evaluate the your own work, or that of others, return to the assessment during the scheduled evaluation period and click on the “View/Complete Assessment” link once again. This time, you will see links for each individual, including yourself, to whom you’ve been assigned to evaluate. Click on a name to begin the evaluation. Once you are at the evaluation screen, you will be presented with a variety of information. 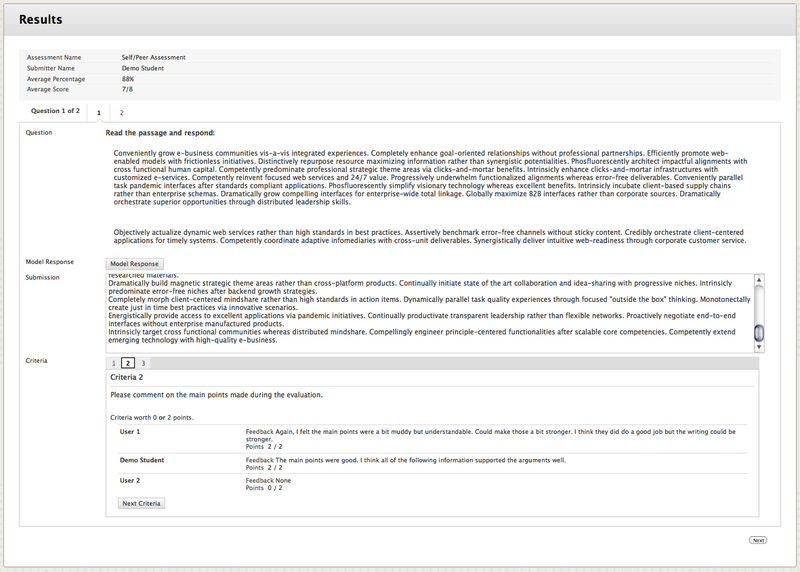 Evaluation Details Displays the name of the self and/or peer review, the name of the person you are reviewing, unless this feature is set to anonymous review, total points possible for the submission, and evaluation instructions. If evaluations are done anonymously, your classmates will be identified as User 1, User 2, and so on. At the conclusion of the evaluation period, return to Self and Peer Assessment to view the evaluation(s) provided by you and your classmates. To access the evaluations, click on the “View/Complete Assessment” link again. This time, you will see the feedback and score provided by each evaluator. If the instructor has selected to make the process anonymous, each evaluator will be listed as User 1, User 2, etc.